Automatic Feedback is a feature for eBay. It is designed to give feedback from one of three pre-set selections (either the basic, auto filled ones CrossPostIt offers, or three that have been set up manually) so that you do not have to worry about remembering to leave any yourself. To access this feature, click the gear in the upper right and go to settings. Click on the Automated Feedback option. This section contains the basic setup for your feedback, including what messages you will leave for buyers. Checking the box for Enable Random Auto Feedback will allow CrossPostIt to respond with feedback from one of the three text boxes below. These 3 boxes are filled with default feedback messages, but they can be adjusted to fit your personal preferences. Below the text boxes are two options for when to leave the feedback. Either when the item is paid for, or when someone leaves feedback for you. 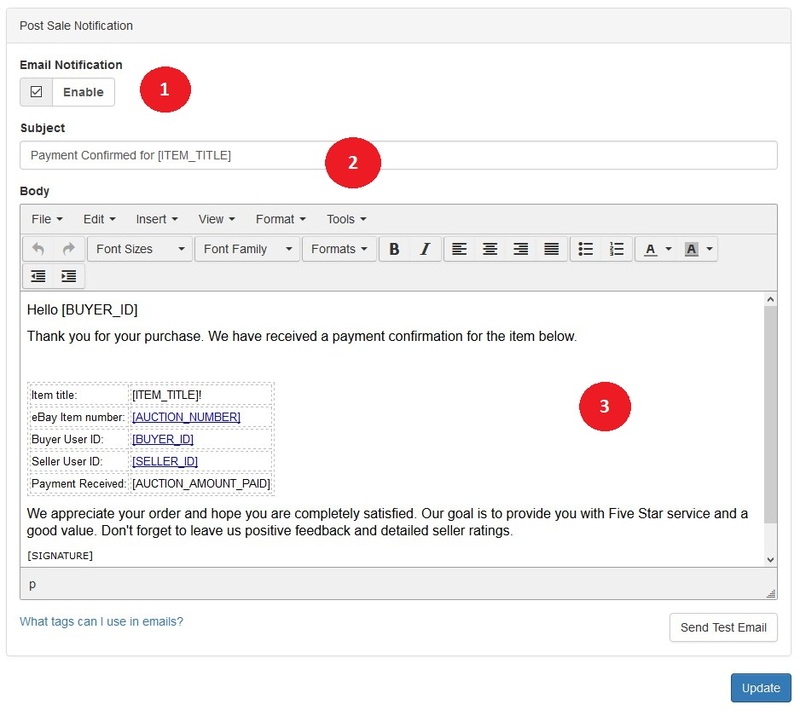 This section contains everything for emails sent to buyers when payment is confirmed. This will be the subject of the email sent. Any applicable smart tags in here ( [ITEM_TITLE] for example) will be filled in with the appropriate information from the sale. The body is where you can adjust the information included in the email. Smart Tags are present in the default email as well. At the bottom of the body text, there is the smart tag [SIGNATURE], which fills in store information. ‘Visit our store’ is a link back to your Storefront. Below the body is a list of applicable smart tags and what they pull for the sake of the email.